Schalke’s 19-year-old attacking midfielder Max Meyer is gradually becoming one of Germany’s brightest young prospects, and a prized asset at Schalke. Certainly one to watch under Roberto di Matteo alongside the likes of Draxler and Goretzka; read below for more. 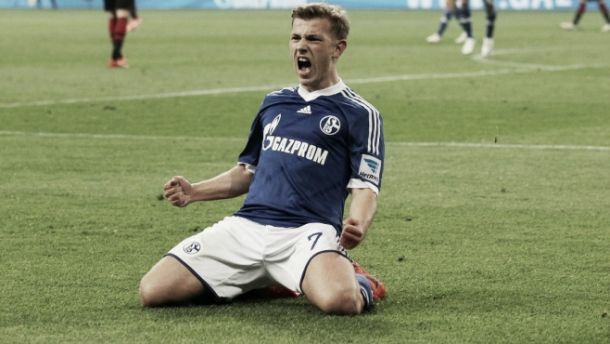 Maximilian Meyer, a 19-year-old attacking midfielder who currently plays his football in the Bundesliga with FC Schalke, is certainly a youngster with a lot of talent, potential and one to look for years to come. He burst onto the scene in German football two seasons ago, taking advantage of his chance when it came as a result of numerous injuries; with a vulnerable Schalke midfield on display, he shone under pressure and has established himself as a player with world-class potential. He was born in Germany on 19th September 1995 and joined Schalke’s youth ranks in 2009, before making his professional debut for the club in the Bundesliga and Champions League competitions in the 2012-13 season. He was very successful with the Schalke U-19 side, winning the U-19 championship against rivals Bayern Munich in their final game, having featured in 15 matches – scoring 11 and creating 11 assists in the process. As a result of his impressive performances, he was rewarded with a professional contract up until the 2015 season, and there were glimpses within his play to suggest that he would settle in perfectly with the first-team set-up at the club. Meyer has played 59 matches for the first-team, scoring 7 goals and creating 5 assists in over 3,300 minutes of football. It may not seem like much, but in his bit-part spell he has been able to impose himself upon the squad and impress other clubs across Europe with his confidence and technical ability at such a young age. Last year, he signed a contract extension with the club until June of 2018, virtually sealing his immediate future with the side that had promoted him to a professional level; he currently wears the number 7 jersey and he has forced his way into being looked at for a potential spot in the World Cup winners squad. Meyer has been involved for both club and country since a young age, he featured as part of their U-17 squad in the U-17 championships, which Germany lost in a penalty shoot-out in the final. He was awarded the best player of the tournament, and has gradually moved up in the national team ranks from U-17, to U-19 and was named in the 30-man provisional squad for the World Cup. He made his debut for the German senior national side in a 0-0 draw against Poland, albeit in a friendly at the end of last season – but this could easily be a sign of things to come over the upcoming years given the amount of opportunities on-show. Meyer himself is predominately a attacking midfielder, who can play at in a deeper role and his playing style has already raised comparisons to the likes of Argentine maestro Lionel Messi, who is easily one of the best players ever to grace a football pitch. Although it would be unfair to compare the two, you can see why Meyer has been dubbed the “German Messi”, because of his dribbling skills and fast-paced speed alone are two attributes hard-to-find. His technique is superb, also. With youngsters emerging at Schalke, such as Draxler, Kolasinac and Goretzka – it’s not hard to see why Meyer has the potential to flourish with these types of young players alongside him.